Shake Your Way to Weight Loss! One of the key factors that can help you achieve your Weight Loss Goal is having the proper diet plan. The main goal of this program is to lessen your Calorie intake while maintaining a steady intake of essential nutrients. In other words, it is like still taking three meals a day except you consume a lot less calories. The secret to this is Herbalife's Formula 1 Nutritional Shake Mix. 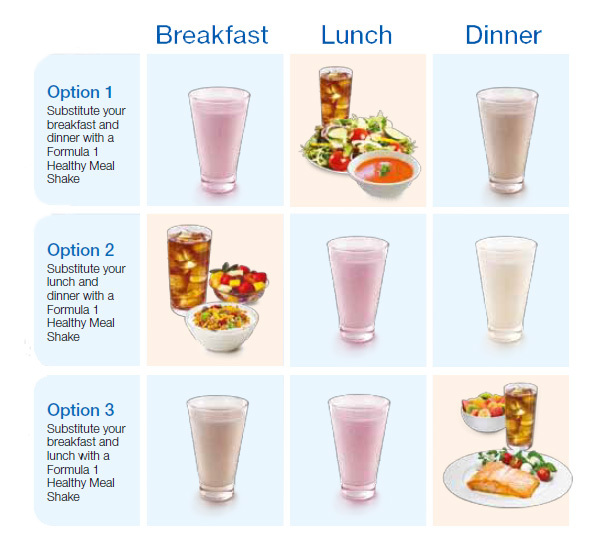 In order to lose weight, substitute two of your three daily meals with a Formula 1 Nutritional Shake. You can also compliment it with Enhancers like Fiber & Herb, Formula 2 Vitamins & Minerals and Fiberbond supplements to maximize your weight loss diet. Most products on the market are food SUPPLEMENTS which means the consumer will still eat regular meals together with the product. 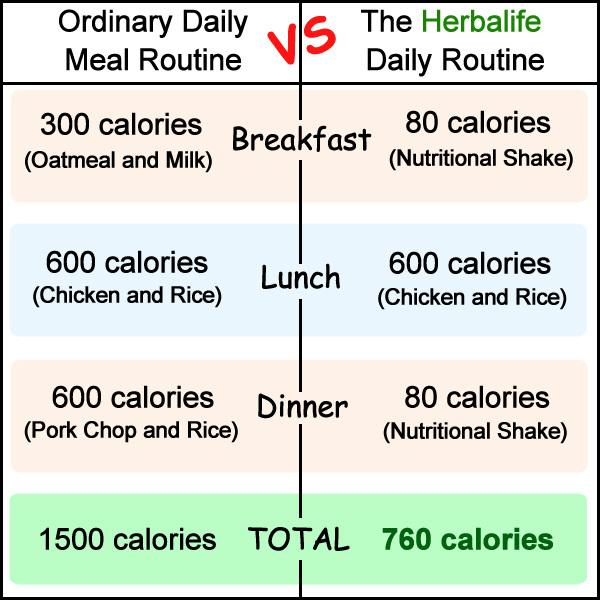 However, Herbalife Formula 1 Nutritional Shake Mix serves as MEAL REPLACEMENT. It is labeled as food in BFAD and FDA, not as vitamins or supplements. Therefore, you can replace you high-calorie meals that can range from 500 to 1000 calories with one Nutritional Shake Mix with only 80 calories when mixed with water (170 cal with non-fat milk). And because of the Low Glycemic Index, you will feel less hunger which reduces your craving for more food. A typical meal (breakfast, lunch or dinner) has around 500-1000 calories. That's around 1500 - 3000 calories A DAY. BUT when you substitute two of your meals with a Nutritional Shake, that would be around 660 - 1160 calories A DAY. The bottom line is: YOUR CALORIE INTAKE IS ALMOST CUT IN HALF! You can even take the program further by taking the Fiber & Herb, Formula 2 Vitamins & Minerals and Fiberbond supplements. Herbalife Fiber & Herb is designed to assist with the removal of body wastes which means less body weight and unnecessary wastes in your system. Herbalife Formula 2 Vitamins & Minerals provides support for your immune system together with 20 essential nutrients and antioxidants. Herbalife Fiberbond helps you feel fuller longer which is good because you will not feel the need to eat too much food. You may also view the catalog for other amazing products or check out the product sets that are designed for weight loss. Learn more about the benefits of Low Glycemic Index here! Ready to lose weight? Check out our products and product sets for weight loss!